A bee approaches a flower cluster and appears to assess the situation, hovering for a few seconds. It then clasps the flower, and vibrates (using its wings), which releases the pollen, much like a saltshaker. The bee collects the pollen and carries it back to its nest for storage and consumption. Drawing from Martins (2008), used with permission. The flowers of African violets are adapted for bee pollination. The shallow cup shaped flower gives a bee ready access to the center of the flowers. The attraction for bees is the pollen which is prominently advertised by the large bright yellow anthers against the blue corolla. There is no detectable scent production to attract pollinators. Both colors, yellow and blue are visible to bees. The bees are rewarded for their visits by pollen which is released by buzz pollination. The flowers do not produce nectar to reward pollinators. 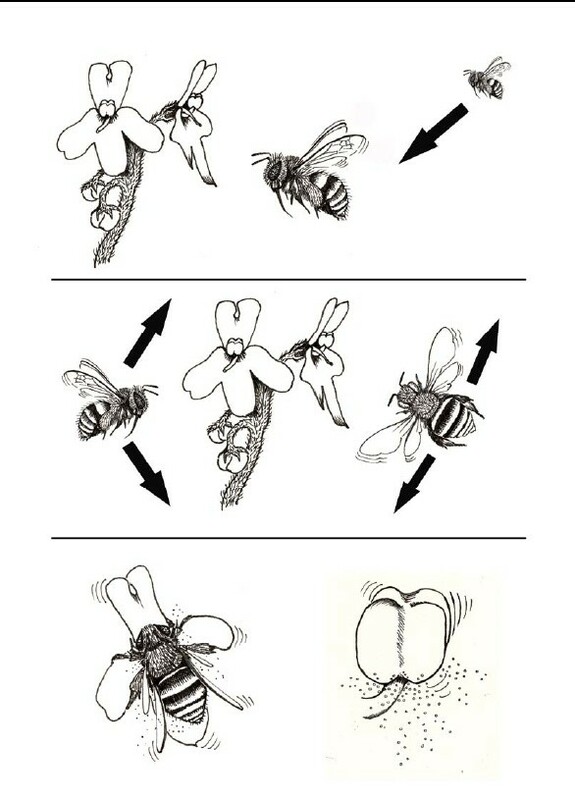 The only confirmed study of pollination is that by Martins (2008), which found bees of genus Amegilla spp. pollinating Streptocarpus teitensis. Harrison, Möller and Cronk (1999) have speculated that the force that drove the separation of African Violets from other Streptocarpus was a switch in pollinators from nectar feeders to pollen feeders. This change was facilitated by a selection for a change in flower shape from tube-like flowers with nectar hidden at the base of the tube to more open flowers with highly visible pollen.